Whenever we see roads being laid anywhere, we see concrete or tar with bulldozers and big mixers. As some of you will be aware, Bangalore now has plastic-blended roads, which have been proven to be stronger, smoother and less bumpier. In fact, all the new road constructions happening in the city (including the contested road-widening project), will be using plastic, according to the BBMP. BTS 7th Main Road off of K H Road, is plastic blended. (Outside Shanthinagar Bus Stand) Pic: Author. But what are these plastic roads all about? I had the same question in my mind when I heard of it. How can a waste material we see in our dustbins everyday be used to make roads? If concrete roads generate potholes how can a road with plastic survive? While we were all throwing our plastic waste in the bins without pondering on where it was going, a plastic bag manufacturer was finding ways to dispose this waste in the most harmless manner. Ahmed Khan, 56, who received the Real Hero Award in April 2008, organised by CNN-IBN and the Dhirubhai Ambani Corp, runs a plastic manufacturing company KK Polyflex that made plastic bags. He felt a social obligation for manufacturing a non bio-degradable product. "When my younger brother Rasool Khan and I were thinking for a solution to reduce the harm caused by our manufactured products, we realised that bitumen and plastic both belong to the petroleum family and both are non bio-degradable. I started thinking of ways to use them together and judicially," says Khan as he goes down the memory lane. Bitumen is used for road construction. But when bitumen alone is used, the road tends to wear out in some time, and the road starts mixing with the soil. At the same time, plastic, once melted becomes extremely hard in just ten minutes. Khan further remembers: "We thought why not mix both plastic and bitumen. We then tried mixing both. Later we experimented by putting the mixture in some small potholes in Jayanagar, unofficially for two years from 1998 to 2000. To our surprise the results of these experiments were positive." After the successful smaller experiments there was need to know if this process was safe enough to be used in the city. Thus Khan approached RV College of Engineering, Bangalore and the Central Road Research Institute, New Delhi (CRRI) wherein some of the professors helped him conduct the research. Khan recalls his anxiety to know the results, "It took two years for them to complete the research. To justify the reports the same technology was tried on a small structure of 500 metres. The report was released in the year 2002 thereby approving the technology. This was an official report by the University of Bangalore." Sign outside Shanthinagar Bus Stand. Pic: Author. The next major task was to get this technology approved to be used on Bangalore roads. The same year the report was released, Khan approached the then Chief Minister S M Krishna. After evaluation of the report, Krishna called for a meeting with his officers and Khan and his brother were asked to give a presentation of their proposal. "The Chief Minister was impressed by our presentation and gave directions to the municipal corporation for our pilot project, which was to lay roads of 40kms. Later those roads were closely monitored and till today they have not worn out," says Khan proudly. The new technology saw an official inauguration of the Rajarajeshwari Arch road by S M Krishna, later in the year 2002, it was after that grand inauguration that K K Plastic Waste Management Private Ltd got their name and therein began their journey to fame. But it did not stop there, a lot more research was needed to prove the safety and environment friendliness of this technology. Khan later went ahead to the Council of Scientific and Industrial Research (CSIR), New Delhi for further research, which he sponsored. The report of this was out in November 2002. And he then got his first order from the BBMP (then called BMP) for 230 kms of roads in Bangalore. The next big hurdle was to get plastic for the construction. Though it was in abundance to get it was not easy. Thus the next big target for Khan were people who would supply him with plastic. Thus he contacted the push cart garbage collectors and some rag pickers for help and gave them an offer more than what they were getting. He offered them Rs.7 to Rs.8 per kg to the rag pickers which was more than what the rag pickers usually got. So the word spread amongst the rag pickers and more and more came in number. "Each rag picker can bring 20 to 25 tones of plastic each per day," he claims. Another plastic blend; J C Nagar Main Road (TV Tower Road), from inside an auto. Pic: Author. According to his personal research on the plastic waste of the city he says that Bangalore produces 10,000 tones of plastic waste in a year. The city has 45,000 Km of roads which will consume 9,000 tones of plastic. Thus most of the plastic can be used. But right now the BBMP is using only 2,000 tones of plastic which is way less than the optimum capacity. Initially the BBMP had set up some collection points but unfortunately these points are not working now. "There were collection points in all the divisions of the corporation but now only five of them are working and that too not so well. There needs to be an organised approach for any project. This is a very viable project provided it should work to its optimum capacity. But the BBMP is not enthusiastic enough to do so," says Khan disappointedly. A K Gopalswamy, Engineer-in-Chief, BBMP says that this technology is used a lot by the Municipality. "We are using it as much as we can. We are going to use it on all the coming constructions including the road widening project that we have undertaken. We have made it compulsory for at least all the major players to use the blended plastic in all the roads. I think this the most we can do." A plastic blended road does not need any repair for five to six years at least according to the BBMP. Khan believes that these roads would stay intact for 10 years minimum. Till today, none of the plastic blended roads in the city have seen any problems. Gopalswamy agrees that the roads are very cost worthy and are the best option presently to answer the road problems as well as plastic disposal issue. But Khan is looking ahead to spread his business. Presently the BBMP buys the final product at Rs.27 per kg which is later provided to the contractors to be used in roads. "Right now we are not getting any profits, it is still in the ‘no profit no loss’ stage," he says. "We are planning to expand our business and are looking forward for venture capitalists who would invest in our technology. Reliance Industries Ltd has already approached us for the same." He is also getting offers from Gujarat, Goa, Maharashtra and Chattisgarh governments. How does the plastic make it into the road? The process starts when rag pickers take their collection to the office of K K Plastic waste management on Kanakpura Road. There it is cleaned, segregated by different grades of plastic, then made into a fine powder and taken to the site of construction. On the site the powdered plastic is then mixed with bitumen in a hot mixer and the mixture is laid on the road. This technology can be done by two processes, one is dry and the other is a wet process. "We are currently using the dry process of making a fine powder of the cleaned plastic and mixing with bitumen (plastic and bitumen are mixed in equal proportions) and then on the site of construction this is mixed with the aggregates and put on the road. In the wet process bitumen and plastic mixture is mixed with tar only. But that requires a lot of investment. And we are planning to do that as our next step," explains Khan. The setting of the bigger plant for the wet processing will cost around Rs.5 to 6 crores, according to Khan. While Khan finds his way out for a profitable business, Bangalore seems to have found a ray of hope for its persitent problem of bad roads. After the road widening project is over most probably we will have for us better roads and not just wider ones. From plumbers: Is Bengaluru’s RWH law working? The demand for installing RWH system has shot up from the last two years as people are now aware of the rainwater harvesting law and the grim water situation. 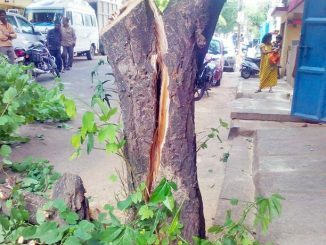 Bangalore, the garden city, witnesses a large number of trees being felled – some legally, most illegally. Your blood boils at the sight of this, but you do not know whom to complain. Who is the right person to complain to? Residential associations in Bangalore will get UID enrollment stations in their communities if they ask for it. The latest on UID enrollment for the city. Well written! I was also told that this process was patented by Thiagaraja College under Kamaraj University. Great narrative of Mr. Khan’s experiments and research leading to the discovery of a better road-topping material, reusing non-degradable waste to boot! I wonder if similar techniques are in use elsewhere in road-building.